When it comes to Davao City travel, there are destinations that are mainstays on the usual travel guides, like the Philippine Eagle Center, which is home to the mighty national bird; Malagos Garden Resort and Eden Nature Park, which boast nature’s pomp in their vast grounds; and Aldevinco Shopping Center, where pasalubong-hoarding is the name of the game. Those are all well and good, but wouldn’t you, dear curious traveler, also want to know what new spots have opened over the past few years, or where the locals themselves go when they want to let loose? Stay at this quaint resto-slash-B&B and get an incredible two-for-one deal: Luxuriate in a clean, minimalist boutique room while being served deliciously healthy eats made from fresh, locally-sourced ingredients. Tucked away in a residential neighborhood, this garden café and restaurant serves sweet bites and hearty meals in a warm, inviting setting. Pro tip: Try their TDF cheesecakes! For no-frills yet all-good dining, visit Cuencos and have your fill of affordable and innovative rice, noodle, and pasta dishes. For an even happier ending to your meal, finish it off with their homemade Choc Nut ice cream. Rizal St. corner Bangoy St.
A favorite among liquor-happy locals, you can’t go wrong with a visit to Huck. Most nights it’s a steady spot to down a drink or two, but on certain weekends when there’s a DJ gig ongoing, things can get a liiittle wild. Perfect for chillnuman, this beach-themed garden bar hidden away in a family compound will give you serious seaside feels. It’s open only on weekends on a reservation basis though, so be sure to get in touch with them through their social media accounts! Kick back with a cuppa at this all-white, no-nonsense coffee shop. Into crafts? Check out arts and craft supplies for sale in the corner or join one of their regular in-house craft workshops. Learn the art and science behind chocolate at this recently-opened museum, indulge in Malagos Chocolate’s award-winning treats at the Chocolate Bar, whip up your own goodies at the Chocolate Laboratory, even try the Chocolate Retreat Spa if you dare. Sounds like a chocoholic’s dream come true. Mabini St. corner Araullo St. Looking for something less fancy, yet no less indulgent? This sweet tooth haven offers dozens of artisanal ice cream flavors which you can pair with your choice of cookie variants. Don’t forget to snap a pic of these IG-worthy treats! Want to bring home something other than the usual pasalubong? 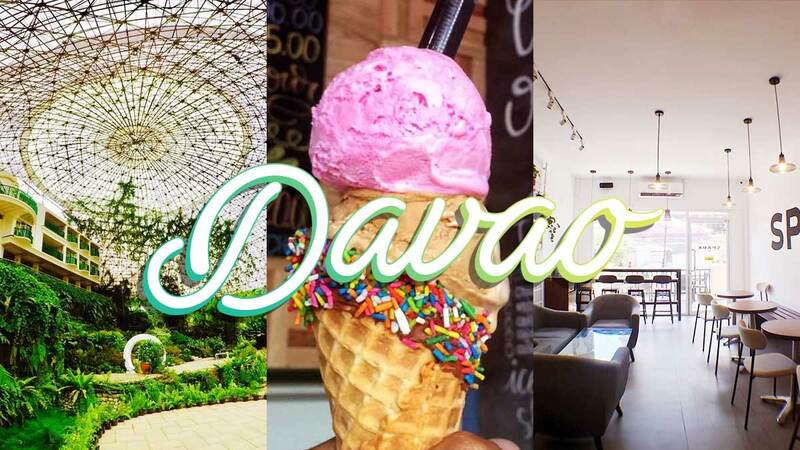 Support local creators by grabbing pieces by Davao-based artists, crafters, and designers at this collaborative shop. The first and largest indoor trampoline park in southern Philippines, Altitude offers both kids and kids-at-heart (i.e. YOU) tons of trampoline setups, a foam pit, an arcade, and a full-service restaurant. Dive into a sea of a hundred thousand white balls at this adult playground designed to bring out the kid in you. A portion of the play fees go to partner charities, so you can bet you’ll be helping out while having fun! Door 5 Autoville Bldg., F. Torres St. Play with 30 adorable dogs that come in all sizes, from cuddly pugs to a barreling St. Bernard. Keep an eye out for a spunky Pomeranian named Sparkle, who will sit on your lap for as long as you like. Purr Box Café, Supplies, and Accessories Co.
Not a dog person? Opt for this café which is home to cat breeds such as Sphynx, British Shorthair, Scottish Fold, and Ragdoll. Savor a drink and dessert while cute kitties saunter around you all chill AF. Slip into Zen mode at this 3.5-hectare park that boasts picturesque gardens, a fresh spring pool, and activities such as fishing, kayaking, ATV and UTV, and gondola rental—perfect for that ~romantic~ photo shoot with bae. A 30-minute boat ride away from Davao City, this luxurious boutique resort in Samal offers a stylish beach escapade—whether overnight or just a day tour—to soothe the city-weary Cosmo girl. A more down-to-earth alternative that’s also a boat ride away in Samal, this rustic paradise comes with room and day tour packages, a restaurant highlighting mango-infused dishes, and spa services including the Kawa Hot Bath—the first of its kind in Mindanao.